TSTET 2019 Pass Criteria, Weightage and Certificate Validity: Telangana govt. has decided to conduct the TS Teacher Eligibility Test (TSTET 2019) to fill the posts in TS Govt Schools. Planning to hold the examination within in the three month duration. Education department officials have appointed the TSTET Convener Jagannadha Reddy(SCERT Director). The test date would be announced. As a large number of posts are vacant, the T govt appointed 7974 academic volunteers for the period of six months this academic year. Despite the appointments, some schools are still running without teachers. According to the officials, nearly 3000 teacher posts are yet to be sanctioned to the schools upgraded to high schools. This means, nearly 10974 teacher posts are to be filled by the government. 1. The Director, SCERT and the member convener TET, Telangana State shall issue Memos/Pass certificates to the candidates. 2. Differently abled candidates with at least 40% of disability only shall be considered in respect of visually and orthopedically disabled. With regard to Hearing Impaired candidates, a minimum of 75% disability shall be considered under PH category. 1. Physically Handicapped with at least 40% handicap only will be considered in respect of Visually Handicapped and Orthopedically Handicapped. With regard to Hearing Impaired, minimum 75% handicap will be considered under PH category. 2. It is to be noted that if a candidate has been allowed to appear in the Teacher Eligibility Test it does not imply that the candidate’s eligibility has been verified. Further qualifying the TET would not confer a right on any person for recruitment / employment as it is only one of the eligibility criteria for appointment. The eligibility shall finally be verified by the concerned recruiting agency / appointing authority. 3. It is further clarified that appearance or a pass in TET by itself will not vest any right in a candidate to be considered for appointment to the post of Teacher in Government / Zilla Parishad / Mandal Parishad / Municipal and Private Aided Schools, unless she/he is in possession of the qualifications prescribed for appointment to such post in the relevant statutory recruitment rules framed by State Government from time to time as on the date prescribed there in for possession of such qualifications. All legal disputes with regard to conduct of TET shall be subject to the Jurisdiction of the courts located in the State of Telangana only. 20% weightage to TET scores shall be provided in the Teacher Recruitment of the State Government. i.e., 20% weightage is for TET and 80% weightage for written test in Teacher Recruitment Test (TRT) based on which selection lists shall be prepared. However, mere qualifying the TET would not confer a right on any person for recruitment/employment as it is only one of the eligibility criteria for appointment. Teachers who were appointed before NCTE notification, dated 23-8-2010 by DSC or by any competent authority in Government / local authority as per Recruitment Rules prevalent at that time are exempted from appearing for TSTET Exam. However, teachers working in private schools whose appointments are not approved by competent authority in Government are not exempted from passing TSTET. Such teachers of private unaided schools can appear at TSTET conducted by either State Government or CTET conducted by Central Government. In respect of non approved teachers working in private aided schools, they should invariably appear at TSTET conducted by the State Government only. Examination Centers for TS-TET 2019: TS-TET shall be conducted in all the 10 Districts of the State. Candidate can choose any Examination Centre (District) of his choice. However, when the capacity of any particular Examination Centre (District) gets exhausted, that particular Examination Centre (District) will not be displayed in the list of examination centers given in the online application form. In such case, the candidate has to choose the Examination Centre (District) of his/her choice from the remaining list available. The Marks Memo/Certificate of TSTET 2019 shall be made available on TSTET website only. There is no restriction on the number of attempts a person can take for acquiring TSTET Certificate. 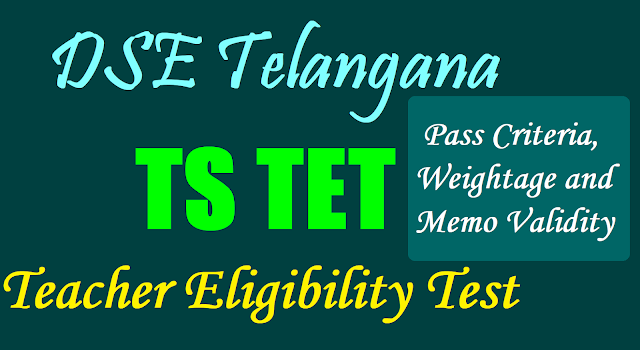 A person who has qualified TSTET may also appear again for improving his/her score. In accordance with the NCTE guidelines the TSTET certificate shall be valid for a period of seven years from the date of examination. The validity of certificates shall be for a period of 7 years from the date of TET concerned. SIR I am from AP AND SECURED 85 MARKS BELONGING TO SC CATEGORY AM I ELIGIBLE TO WRITE DSC IN NON LOCAL CATEGORY?